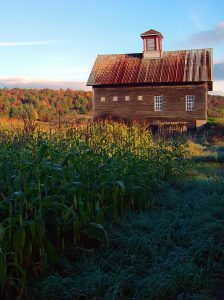 Home > Blog > Come visit us in Vermont in the Fall! Come visit us in Vermont in the Fall! If you tallied the number of countries our staff has traveled to, it would probably be close to 70. We actually haven’t bothered to get an official number, we just know we’ve traveled a lot! And while we have had incredible experiences around the world and ever-growing bucket lists, we love—and I mean LOVE—Vermont. Only 2 of us are official “Vermonters”—born and raised here. The rest of us are transplants who chose this beautiful state as our home for the pace of life, plethora of outdoor activities, delicious farm-to-table food, and the open landscape of pasture and mountains. This enthusiasm for our little corner of the world has led us to create a Special Departure to share Vermont with the Boundless Journeys family of travelers. 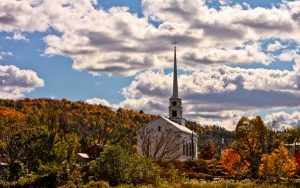 Vermont: Peak Foliage Hiking is a 5-day itinerary crafted to introduce our guests to the essence of Vermont in two of the state’s most charming villages (Stowe and Woodstock) and by exploring the pastoral landscapes and Green Mountains. 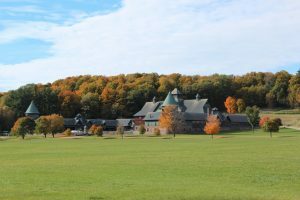 We’ll also explore two of Vermont’s most iconic places: Trapp Family Lodge, built by the famous Austrian singing family, and Shelburne Farms, a former Vanderbilt estate that is now a non-profit, sustainable education center and working farm. Easy to moderate hikes and walks will take us to the top of the highest peak in Vermont, to a 13,000 year-old natural gorge, along farm trails, on the shore of Lake Champlain, and more, all while taking in our world-famous fall foliage! While we certainly bask in the greenery and warmth of the summer, and welcome it after Stick Season (the period of late fall/early winter when all the leaves have fallen but it hasn’t snowed yet) and Mud Season (that’s what we call spring in Vermont), it’s really the fall that most of us wait for all year long. 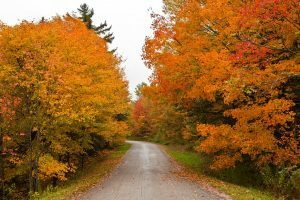 There are so many things to love about autumn in Vermont—it is a feast for the senses—the vibrant colors everywhere you turn; leaves crunching underfoot; freshly-picked apples, squash, and corn; the scent of wood fires; and the crisp air and warm sunshine. Hiking this time of year is usually very comfortable. It might be cool in the morning, (breathing in the crisp fall air is so refreshing!) but once you’re out on the trail and the sun is overhead, you’ll quickly warm up (although we make it a point to never leave home without an extra layer!). And although rain is a possibility at any time of year, early October sees many clear days with views of Lake Champlain, the Adirondacks, and maybe into Canada and New Hampshire if you’re on a summit or a ridgeline. One of my personal favorite things about Vermont is that you’re never more than a couple miles from a farm. 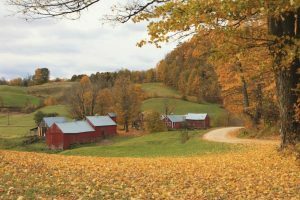 And that landscape manifests itself in the restaurants, most of which are built around the ethos of eating local and doing their best to source as much as possible from Vermont farms. You’re also never very far from a brewery, as micro-breweries have been popping up all over the state in recent years. Artisan cheese, craft brews, and of course maple syrup, basically make up our food pyramid here (but we have artisan chocolate, hard cider, and even wineries, as well!). 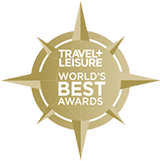 We are excited to share this experience with adventurous travelers like you! Our home team will have the chance to spend time out of the office and on the trail with our hiking group. Everyone will get to put faces to the names, a rare and welcome opportunity for us to meet our guests in person! For more information, and if you have any questions or would like to reserve, give us a call at 1-800-941-8010.